A team of scientists has recently presented evidence of an unexpected drop in the observed magnetic field of an accreting pulsar designated V0332+53. This downturn, observed after the pulsar underwent a bright, three-month-long X-ray outburst, could yield important information on how the accreted mass settling on the surface of a neutron star affects its magnetic field. The findings are detailed in a paper published online on Apr. 26 in the arXiv journal. 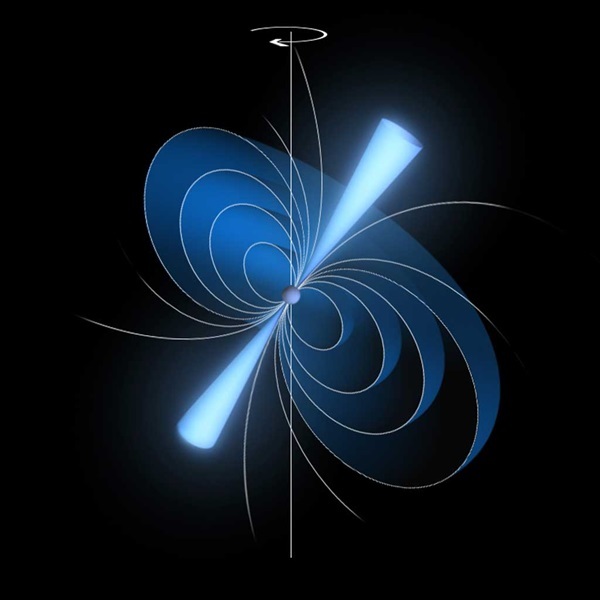 V0332+53 is an accreting pulsar emitting X-ray radiation, with a spin period of 4.4 seconds. It orbits an early type companion star in an eccentric orbit of about 34 days. Significantly, this pulsar shows sporadic giant X-ray outbursts lasting several weeks, followed by years-long intervals of dormancy. These X-ray outburst were observed in 1989, between November 2004 and February 2005, and between June and September 2015. The latest outburst drew the attention of a team of researchers, led by Giancarlo Cusumano of the Institute of Space Astrophysics and Cosmic Physics in Palermo, Italy. 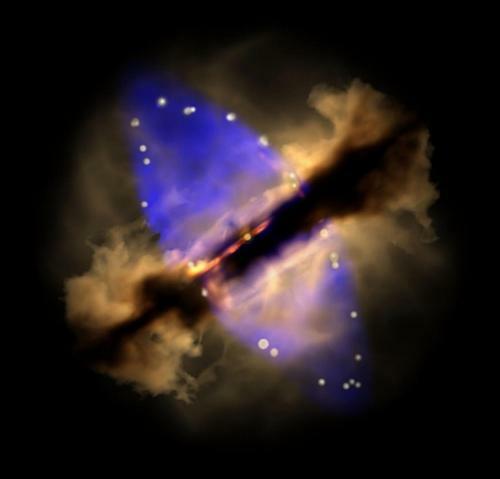 Using the Burst Alert Telescope (BAT) and the X-Ray Telescope (XRT), both mounted on NASA’s Swift spacecraft, the astronomers were able to observe the pulsar in soft X-ray and high-energy bands. By studying the results, the team detected a noteworthy drop in the observed magnetic field between the onset and the end of the outburst. “The comparison of the XRT profiles in the soft X-rays provides a hint against the hypothesis of a geometrical beam variation. If, on the other hand, the line-forming region is the same at equal luminosities, the observed difference in the cyclotron energy corresponds to a difference in the magnetic field of about 1.7 ×1011 G,” the researchers wrote in the paper. 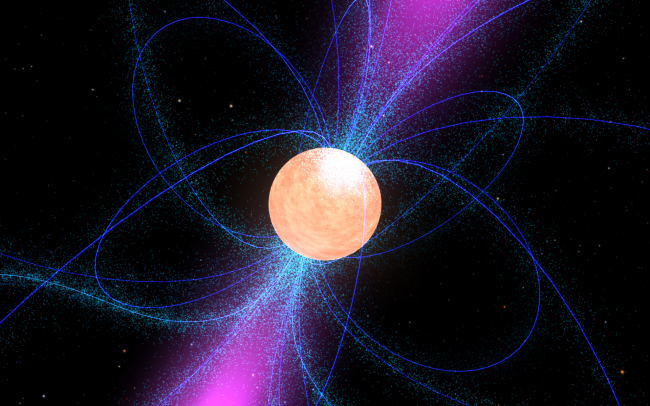 The findings could be crucial for our understanding of matter accretion processes in neutron stars and could provide new insights on pulsars’ X-ray outburst events. 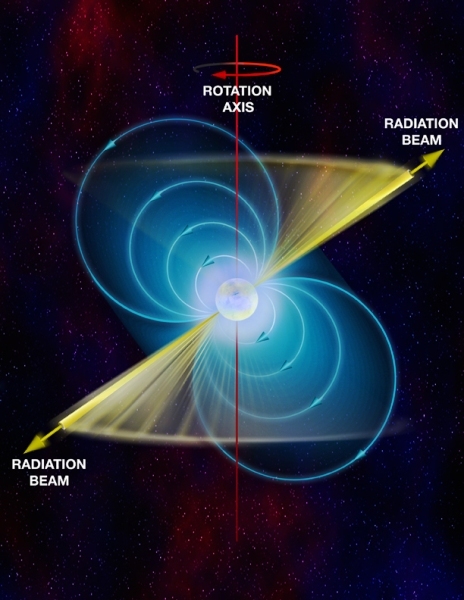 According to the research, the magnetic field of neutron star drives the accreting matter along its field lines towards the magnetic polar caps, forming an accretion column, where matter is followed up by radiative processes that produce X-rays. Notably, the drop in the magnetic field, as described in the latest paper, wasn’t observed after previous outbursts. The researchers found out that although the total mass accreted at the end of the 2004-2005 and the 2015 outburst is similar, during the 2004-2005 event, a higher luminosity was reached earlier. They also concluded that decay of the magnetic field is not directly proportional to the total accreted mass. “In this hypothesis, the accreting plasma builds up to form a magnetically confined mound, where the gas pressure balances the magnetic stresses. This would produce, as an overall effect, a distortion of the field lines observed as a decrease of the field component along the accretion column,” the paper reads. However, as the team noted, the lack of coverage in the first ten days of the outburst doesn’t allow them to confirm this theory.